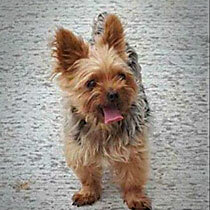 We want to send our deepest sympathies to Karrie for the loss of her precious Yorkshire terrier, Zoe. Zoe, of Bunker Hill, went missing the other day. Karrie did everything she could to find her little one DFD went out to track, and the track led to a pond where little Zoe was found, passed away. It was a heartbreaking discovery, but at least there is some closure. Please send your prayers and comfort as they heal from the loss of their little Zoe.